Happy New Year! I hope you are amazing! It’s been a long time since I've written. This last year of Leelee’s Garden was wild. 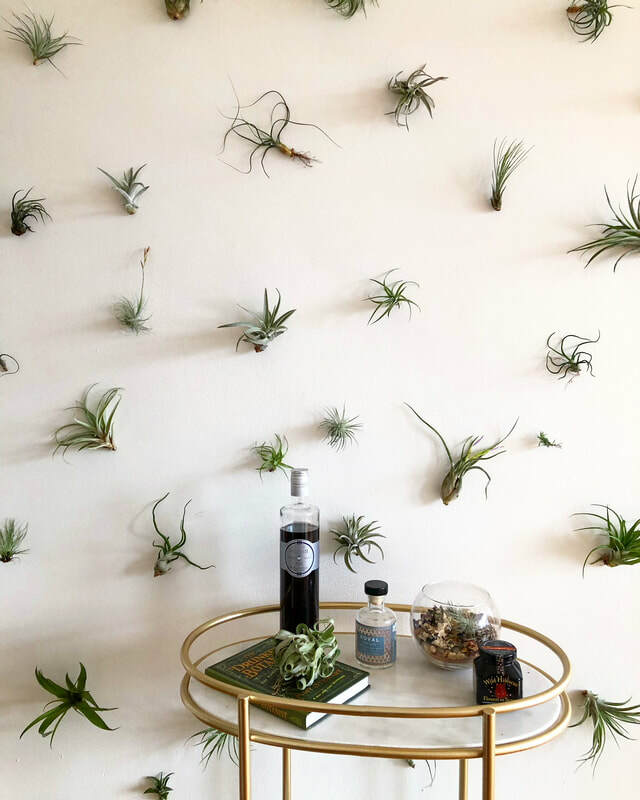 I moved back to Chicago, created the indoor jungle apartment I've been dreaming of, hosted workshops, speaking gigs and did event floral design here, in California and on the East Coast. Through it all, though, I missed sharing projects and ideas here with you! In this time of fresh starts and new beginnings, I’m dropping you a little love note to say this year I'm getting back into writing this blog/mini e-mag. Here and there, about once every couple weeks, I'll send you free diys, tips (see a mini one below! 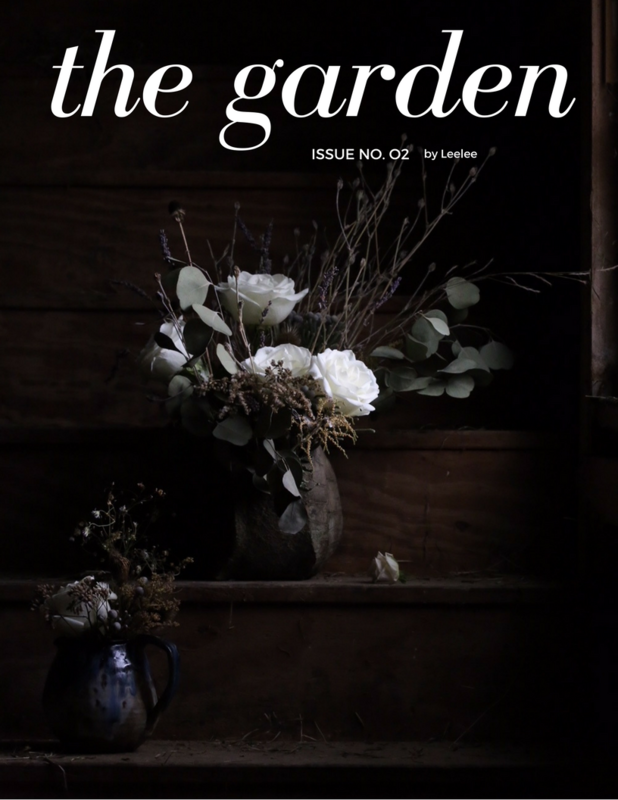 ), and inspiration for living a more botanical life with plants and flowers. As I’ve been mapping out what else I'll focus on in 2019 in life and in business, I keep thinking about what I’ve learned from this community. If you've been to one of my in-person workshops, you know I always ask groups why they come. My favorite answers have been when students share they show up because of a New Year goal or intention to be more creative. One woman said she chose a new Dabble workshop every month to learn a skill. Another wanted to make small additions to her life that would make it more beautiful, more sparkly. What’s your one just-for-fun goal for 2019? I’d love to know what yours is in a comment here below. Here’s to a beautiful 2019. I can’t wait to see what we grow and create! P.S. Are you in Chicago? Looking for a little #indoorjungle inspiration for your green thumb goals? For the first time I’m opening my jungle home studio up for small group workshops! Come join me to make your own gemstone terrarium over the next week (or maybe a goals garden) and get a peek at my own wild world of plants. Click here to get all the details and register. I first heard the term foraging related to floral design a few years ago and honestly didn’t really get it. You mean you just get stuff on the side of the road? It surprised me that high-end designers were traipsing through the woods, stopping at islands on roads, and wandering abandoned industrial parks to gather (semi-legal) product for designs. One designer I met at a design conference who did holiday florals for the Obama family in the White House actually injured her eye getting an apple tree branch for her demo. Dedication to the trade! 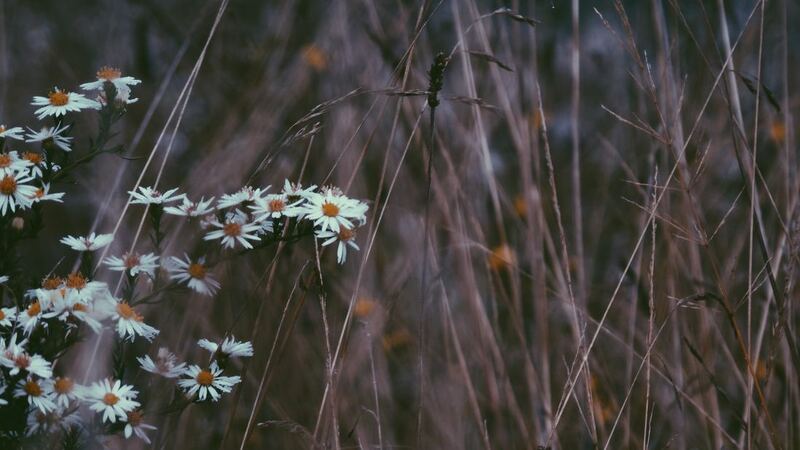 Foraging is a mainstay of most modern designers in this era of nature-inspired florals. If you see huge installations with branches or find seed pods in your wedding bouquet, a designer or assistant probably collected these castaways in some (hopefully legal) way. Today most floral design books include foraged finds too. My naturally anxious and rule-following nature has made me slow to embrace the foraging phenomenon in floral design. 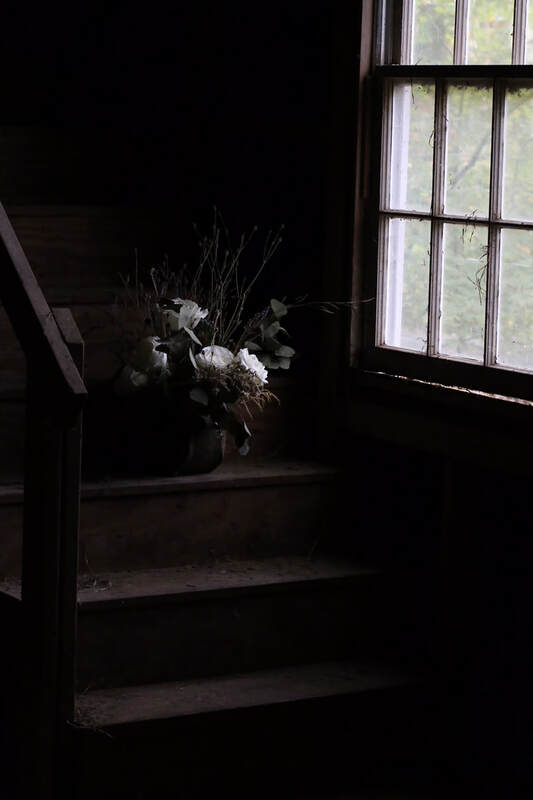 But over the last several months I’ve come to really appreciate what the natural element adds to cut flowers: a connection to the seasons and a sense of life (or death) that you just don’t get the same way without adding found materials. 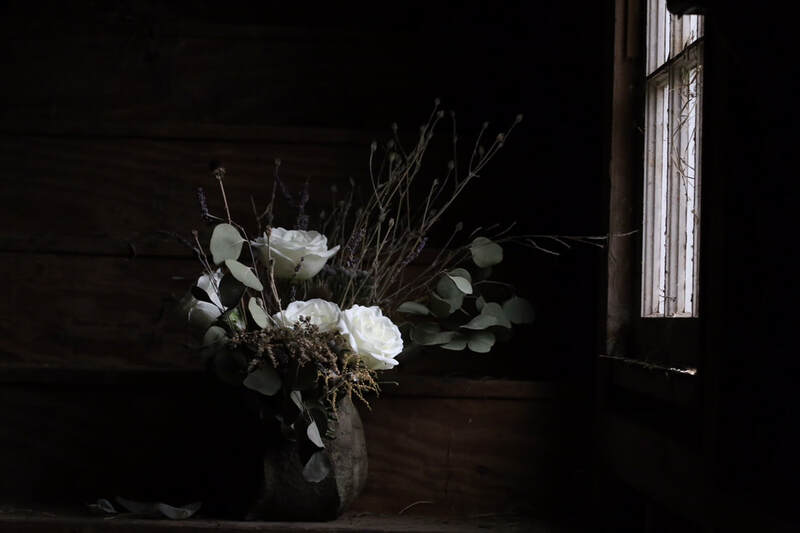 In October I did on-site floral design at a retreat hosted by Sarah Jenks on her beautiful property, Hawthorn Farm. I set up a makeshift studio in her backyard woods in Medfield, Massachusetts. I had acres of land to source from and free rein on what I could create…a dream come true for my public foraging-shy self. 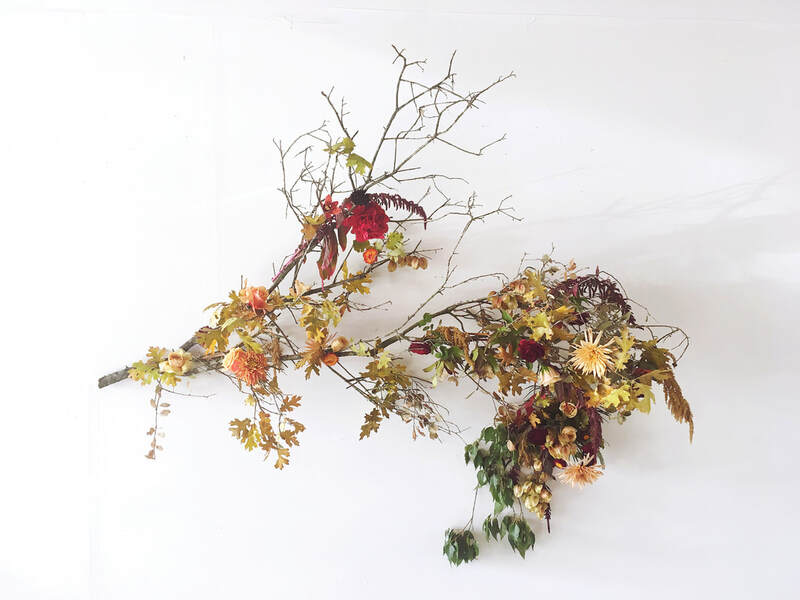 I used grasses, wildflowers, pods and branches to create a fall look inspired by the land. 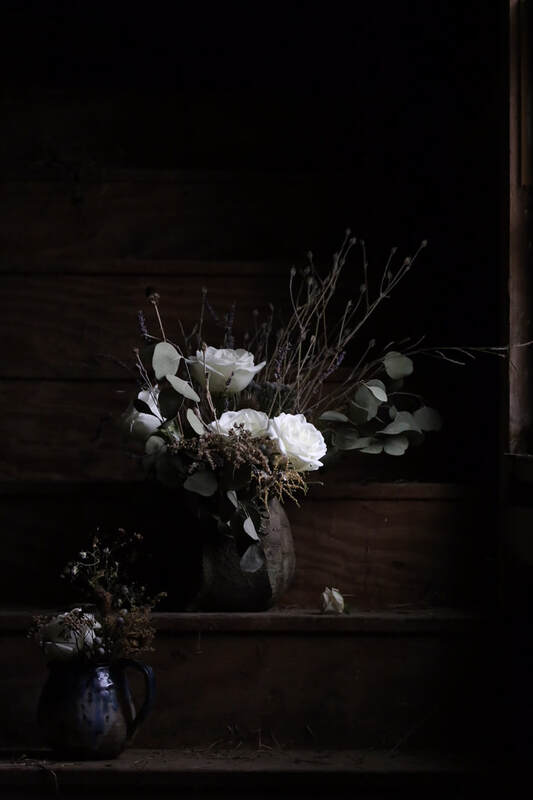 These found materials transformed what would otherwise have been simple white rose and dried eucalyptus designs into etherial late fall still life pieces captured in a photo shoot with my friend Katie Lenhart. If you are curious and want to play with foraging yourself, go for it! Get outside and find materials with textures and shapes that inspire you. As you design florals at home, you can add your natural finds to more traditional flowers to make them come alive with the season. When you start foraging, there are three main things to keep in mind: pests, problem plants, and local laws. Pests: Be sure to wear gloves, watch where you step, and let product sit for a couple hours outside after you pick it to encourage insects to wander off. Problem Plants: Watch out for plants like poison oak, poison ivy and poison sumac. If you are at all unsure about these, get a refresher before you head out to forage. This guide is really thorough. Local Laws: I was lucky enough to forage recently on private property with the owner’s blessing. But, if you are foraging on public land or on the side of the road, learn the local rules (or decide for yourself how much you don’t want to know). Definitely don’t forage from protected parks and forests. And never pick fruit from trees you don’t own without permission. Who doesn’t love sage? The piney, peppery taste, soft color and feel, and decidedly fall vibe make this herb my top pick to kick off my new herb series! Let me take you on a tour of all things sage…it’s history, tips to grow your own, and inspiration for how to use it all season long (and not on your turkey)! Salvia is the botanical genus name for a group of sage varieties. I use common sage, salvia officinalis, in these examples, but you can use other (edible) varieties too. Salvia comes from the latin word salvere, meaning "to be saved," and has been used medicinally for centuries. 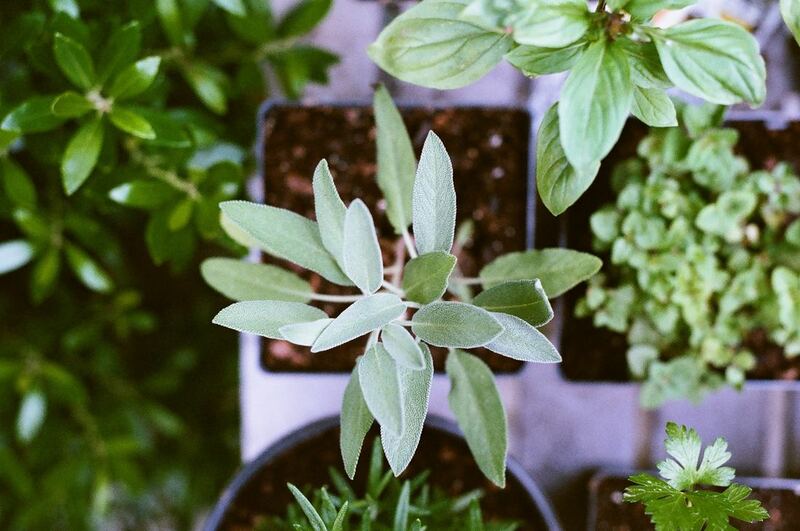 In the middle ages people used to say, "Why should a man die when sage grows in his garden?" Sage was used to fight all types of infections and ailments, particularly tooth decay, colds, hot flashes, and even sweat. Sipping sage tea was an early form of deodorant! Today sage is still used medicinally by herbalist and is also recognized as a good source of vitamin K, which supports blood and bone health. This hearty, drought-tolerant and forgiving herb is easy to grow indoors or out. Start with: Plants. Seeds are tricky to start. Variety: There are many varieties to choose from. For cooking, start with common sage and then branch out to tricolor sage, pineapple sage and all the rest. Ambitious? Pick 3 and grow a variety pot or patch. Sun/Light: Sage does best in full sun, but can be grown indoors if it gets a lot of light near a window. Water: Sage is drought tolerant and doesn’t like to have wet feet (roots). Water thoroughly and let dry between waterings. Harvest: To encourage growth and preserve herbal oils, in the morning clip just above a bud, where two leaves meet. ​Cold: A hearty perennial, sage is cold tolerant, will last through late fall and come back year after year outdoors in most zones. Lately I’ve seen sage smudge bundles everywhere! 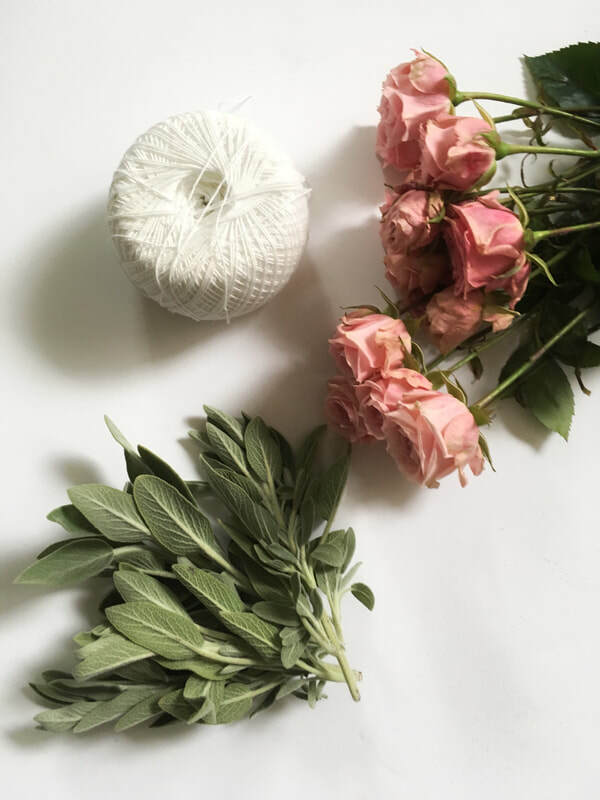 Between my recent trip to Massachusetes to do on-site florals for a retreat (you can read more about the trip here in the Found Beauty article), more than a few episodes of Grace and Frankie, and a lot of #witchy going on in my Instagram feed, sage sticks are having a moment. Have no idea what I’m talking about? Sage bundles, also known as "smudge sticks" are used for smudging. Smudging is an ancient practice of energy clearing. 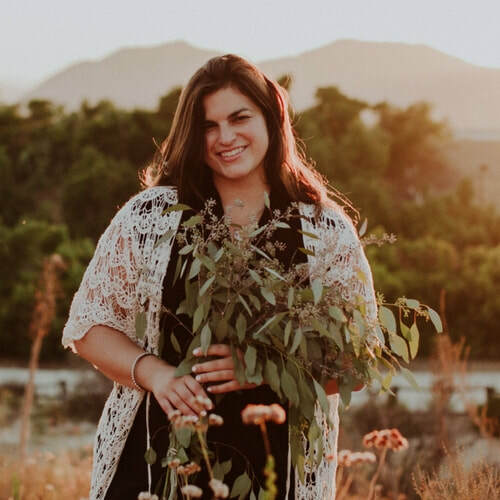 By burning what are considered sacred plants (and sage is at the top of this list), you clear away the stagnant or negative energetic gunk lingering around you, your home or environment. It’s like a #goodvibesonly reset stick. You can smudge after a big clean-out, before you start anything new in a space, or before a ceremony or holiday. New pre-Thanksgiving dinner tradition? I'll show you how to make your own sage stick with a little floral twist. Not into the spirit woo-woo stuff? That's okay! These are sweet, earthy florals you can dry to add a natural touch to your home for winter. They also make fun gifts for your boho-hippie friends this holiday season. Gather sage into a bundle at least 4 inches long. Add in roses. You can also make a sage only bundle. If you're using roses, play with the placement. I suggest putting one in the center and then at varying heights around the bundle. Wrap it. Tightly wrap string around your bundle several times, working around the more delicate rose heads. You can do this in clean lines (several spots along the bundle length where you wrap two times) or criss-crossing the whole length (what I do), wrapping the stems several times to finish. Cut, leaving at least 6” left of string to hang. Cut stems down to be the same length. Once your bundle is dry, you can use it to sage your space. The string may be loose after drying. Some people avoid the problem by drying the sage first or using rubber bands instead of string. You can play with these options or just re-tie if you have a loose bundle. Carefully light the leafy end of your sage stick. Blow out and wave the bundle and smoke around yourself, home or workspace with the intention of clearing away everything that's stale and stagnant. Always have a saucer (or traditionaly an abalone shell) nearby to catch embers and put out the bundle when you're finished. *Traditionally, bundles are made with white sage, but I used common sage here, which is a little easier to find at the grocery store, in your garden, or farmer’s market. It still works for clearing. 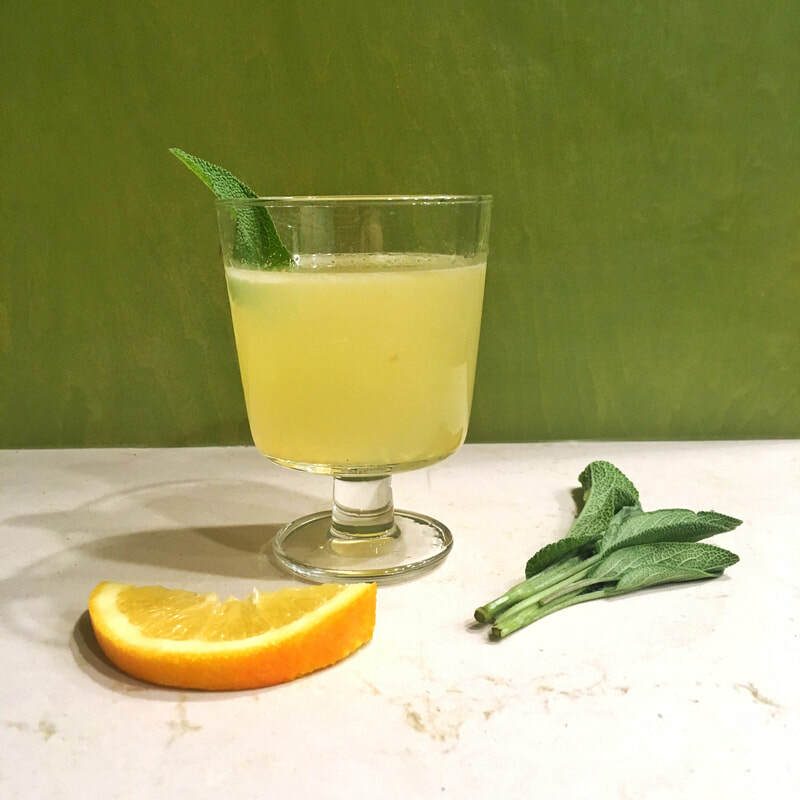 With it’s piney taste, sage is ideal for late fall and winter cocktails! I came up with this sage-y twist on the prohibition era Bee’s Knees. Sage and lemon forward, it’s somehow summery and wintery at the same time, just like my home town San Diego this time of year. Give it a try and let me know what you think! Don't drink? Skip the alcohol and you’ll have a tasty winter lemonade. Combine ingredients in a shaker with ice. Shake! Strain and garnish. Combine ingredients in a small saucepan over medium high heat. Once honey dissolves, reduce to a low simmer and let simmer for 20 minutes. Let cool. Makes enough for 4 cocktails. ​Have a question about growing or using sage? Let me know in the comments below!